Units. Sets if inches or centimetres have to used for the album size. Language. Selects the application language. Hide used images. Enabling this option the used pictures won’t be shown at the left pictures list instead of being framed. Place guides. Sets if margin guides have to be displayed at the design. Preserve aspect ratio by default, if enabled the application will open with mode 2:3 activated. New spreads are panoramic by default. If enabled new spreads added to the album will be panoramic instead of double sided. Disable help baloons, disables the help baloon shown when hovering the mouse over an icon or element of the application. 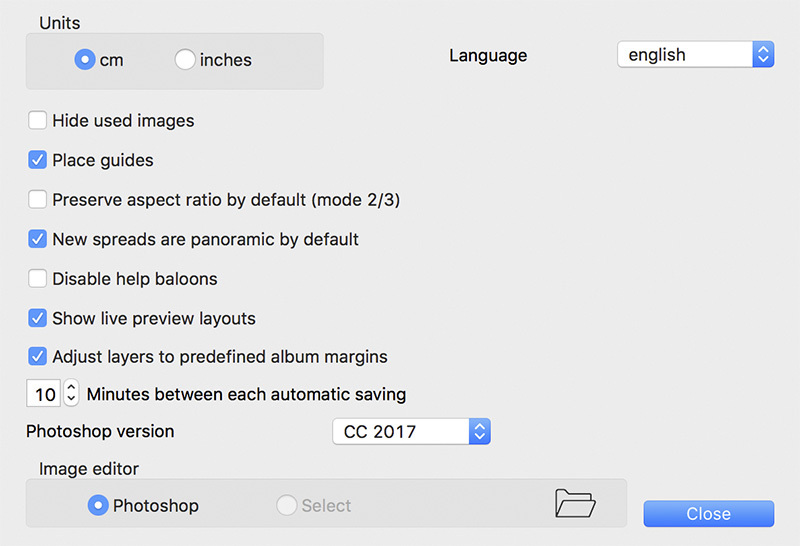 Adjust layers to album margins, enabled by default this option ensures that all layers which are not at full bleed will be placed inside the safe area of the spread. Notice that guides will show you the safe area limits even if this option is disabled. Minutes between automatic saving, sets the time between each automatic spreads saving process. The application also creates a backup every 2 hours. Photoshop version. If you have Photoshop installed please select the Photoshop version for allowing the Photoshop export and pictures edition in Photoshop. Image editor. This is the editor used for your pictures, you may select your preferred editor (by pressing at Select) or Photoshop.